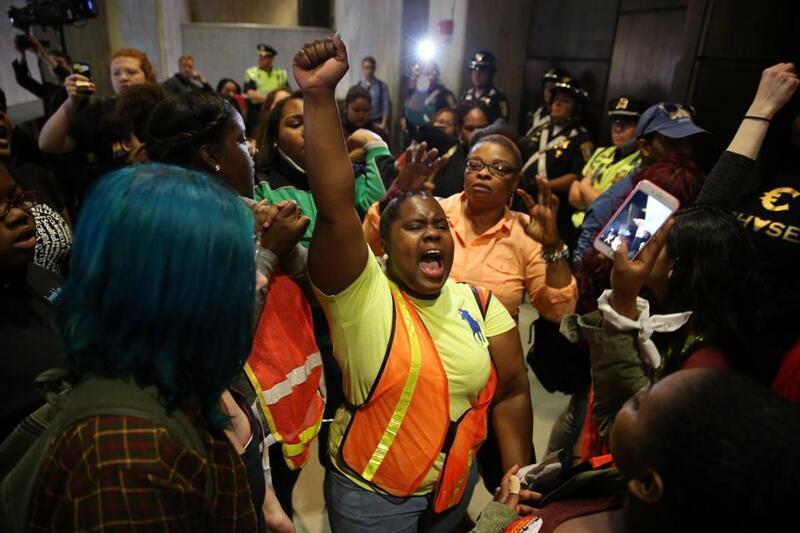 Fania Joseph, a sophomore at Boston Community Leadership Academy, led a chant outside the city council chambers. Hundreds of Boston students walked out of class Tuesday to protest cuts to the school budget, then thronged City Hall Plaza and an emotional City Council hearing to call for full funding of education. The rally, the second in recent months, capped a school year in which students were emboldened to speak up. Rhianwen Kast-McBride, a freshman at Boston Arts Academy, was among the 200 students and their supporters who marched to City Hall. She was concerned not only about the cuts being made this year, but about those that could come in future years. “I have three years left of school, and I don’t want to go through school losing all the resources we have,” the 14-year-old said. For a second time this year, students are walking out of classes to protest budget cuts. As the City Council budget hearing stretched into its second hour Tuesday afternoon, the student rally moved inside City Hall, with chants of, “BPS! BPS!” and “The whole world is watching!” filling the council chamber, nearly drowning out the voices of public schools staff members. Dozens of Boston police stood at the ready, but no clashes with protesters were apparent. Students and parents, who were invited to the hearing by Councilor Tito Jackson, delivered emotional testimony, with several breaking into tears. Some asked why Boston students receive fewer resources than those in wealthy suburbs. One mother said her family plans to leave Boston because her daughter, a special education student, would receive less support under the new budget. Jahi Spaloss, a senior at Boston Green Academy and one of the organizers of the walkouts, said he was frustrated that students had to fight for resources. Spaloss called on the council to stand up for students. Students demonstrated at City Hall Plaza against cuts to the Boston schools budget. Some protesters asked why Mayor Martin J. Walsh was not there to hear their concerns. His press secretary said he was away from City Hall on Tuesday afternoon because he was committed to participate in a dialogue at Northeastern University about race relations. In a much larger March walkout, students streamed out of classes by the thousands, leading Walsh to cancel across-the-board cuts to high schools. This month, hundreds of parents, teachers, and students participated in early morning “walk-ins,” protesting at campuses around the city before the first bell. City officials say that the School Department is getting a budget increase in line with those of other vital city services — such as police, firefighters, and ambulances — and that boosting funding using one-time sources would increase structural deficits for future years and potentially hurt the city’s credit rating. The school district’s budget for next year is more than $1 billion and includes a $13.5 million bump. Officials say spending for next year will likely increase after the School Department completes contract negotiations with the Boston Teachers Union. Jackson says Boston has enough money to avoid school cuts. He is pressing Walsh to increase the district’s budget for the next academic year by more than $30 million to keep up with rising costs. At City Hall Plaza on Tuesday, Sean Hargrove, a 17-year-old student at City on a Hill Charter Public School, said he joined in the protest even though his school was not scheduled to face cuts.